A backyard is an extension of what's going on inside our home, maybe more colorful, casual, fun, and without a ceiling to put a lid on our needs and desires. In a yard, trees and vines can climb to their ultimate heights, light and weather can quickly change, and the possibilities—within the confines of our property lines—are up to the terrain, our design skills, and our do-it-yourself know-how. If it's evident that your backyard remodel or update can't be a DIY project, hire a landscape designer or architect to help your outdoor space realize its potential. A skilled professional can guide you through the process of figuring out a style, deciding who will be using the yard, creating zones of activity, choosing materials and plants, and recommending builders and contractors for everything from swimming pools to outdoor structures to installing irrigation. Explore 50 ideas that show how a backyard can be transformed into everyone's favorite space. Continue to 2 of 51 below. How do you design a backyard for two toddler boys and their parents that is safe, engaging, and attractive? Creo Landscape Architecture more than fulfilled the challenge with this San Francisco area home that includes dining and seating spaces along with a grass-covered berm and interactive sculptures for the children. The fence and bench are made of redwood—the fence features a light stain while the bench is natural—and Podocarpus were planted for privacy and greenery. A no-mow fescue on the mounds of the berm invite the boys to roll, tumble, and enjoy their backyard. Bluegrass is planted on the flat areas and recycled brick is used for a small patio. Making smart use of the space, those redwood benches also store outdoor toys when not being played with. Continue to 3 of 51 below. Developer Joseph Eichler's name has become associated with the Midcentury Modern California housing tracts that he built in the 1950s and 1960s. While most were in the suburbs, the 1962-built Diamond Heights Eichlers are in the city of San Francisco's Visitacion Valley neighborhood. The Garden Route Co. remodeled the landscape of a two-story Diamond Heights Eichler with a steep hillside garden. The challenge: creating flat, usable outdoor living spaces by building terraces and stairs that connect the different levels. With an emphasis on texture, plants with bold forms, and colors, the garden softens the angular landscape architecture and gives the backyard a modern update. Continue to 4 of 51 below. The owners of this Boston area property wanted to stretch their living space to the outside and enjoy the beautiful woodland setting as close to their back door as possible. Landscape designers A Blade of Grass reconfigured the back porch to step down to an adjacent raised bluestone patio. The firm created a series of outdoor rooms that progress from highly developed to naturalized native plantings and include an outdoor fireplace, a koi pond, a shade garden, and irregular bluestone paths. Plants include Viburnum dentatum, pink flowering Astilbe ‘Vision in Pink’, Malus ‘Whitney’, Buxus ‘Green Mountain’, yellow grass Hakonechloa ‘Aureola’, Pennisetum ‘Hameln’, and the tree Betula ‘Whitespire’. Continue to 5 of 51 below. A large water bowl is the centerpiece of an Islamic-style courtyard garden in Hertfordshire, England. The clients of landscape designer Fiona Green of Green Tree Garden Design had lived in the Middle East and wanted their garden to reflect the styles they had seen in their former region. Following the principles of Islamic Garden Design, Green designed a courtyard with a water bowl in one corner of the yard. Placed opposite the courtyard is a new summerhouse, which can be viewed from the courtyard seating area. Green renovated the backyard and replaced plants that offer year-round jewel-tone colors, along with structure, and scents. Continue to 6 of 51 below. Josh White, JW Pictures Inc.
With respect to its 1959 Midcentury Modern origins, (fer) studio, LLP oversaw site improvements of a Sherman Oaks hilltop home owned by Davis Factor, photographer and founder of Smashbox. Preserving its post-and-beam construction and rhythm, (fer) studio added a carport, cabana, and a gym with private patio to the master suite. Along the way, Factor bought the property next door and his home was expanded to include a 2,700-square-foot guest house. Along with landscape architect Victoria Pakshong of [place], (fer) studio designed a landscape plan for the now-larger property's natural upslope. A railroad-tie path traverses the entire width of the estate, while the driveway—or elongated entry experience—is made of concrete pavers and permeable Grasscrete. The pool and outdoor activity zones are built with an emphasis on the horizontal lines of the property and maintain a low profile so that nothing obstructs that fabulous view. Continue to 7 of 51 below. CNC Building Professionals designed a long, floating bench that integrates the interior with the exterior of this home in Sydney, Australia. The homeowners' children enjoy climbing the stairs that lead from one slate-covered patio to another—the higher one acts as a stage for impromptu performances when not used as a courtyard patio. Continue to 8 of 51 below. 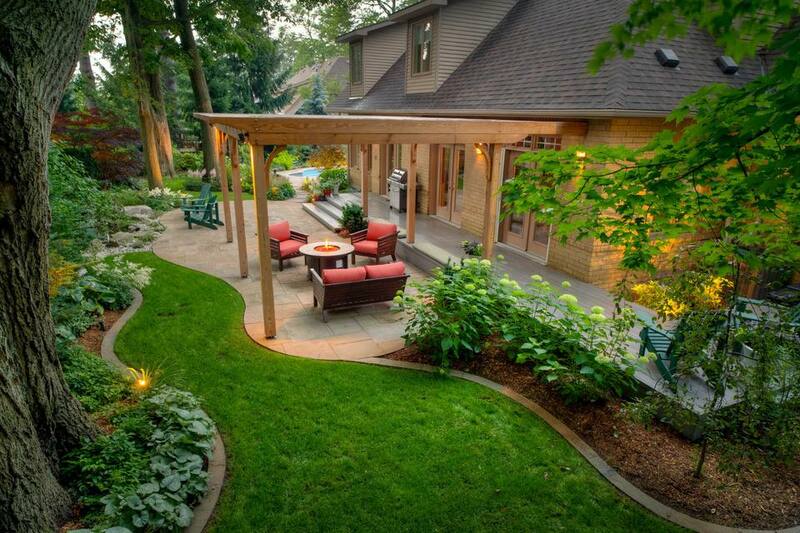 Landscape designers are often contacted when homeowners' lifestyles and needs change. For the clients of Jane Harries Garden Design, the children had "grown out of football and guinea pig ownership, and they wanted a restyle," says Harries, of Northamptonshire, England. Starting with the removal of a couple of oversized trees, Harries reconfigured the lawn to create larger borders and an informal planting design with a romantic feel. The children's swing was replaced with a porch-style swing settee and a water feature near the house provides a natural transition from indoors to the terrace. Continue to 9 of 51 below. Beth Edelstein of the Los Angeles area firm BE Landscape Design, removed the lawn and replaced it with raised stacked-stone planter boxes for growing vegetables and herbs. The drought-tolerant landscape design now includes benches, a fire pit, and containers set on decomposed granite (DG) and concrete stepping stones. Continue to 10 of 51 below. The owners of this home located in the Clapham neighborhood of London contacted Kate Eyre Garden Design for a redo that includes attractive wood fencing, a cozy seating area, and lots of gorgeous Viburnum bushes. Continue to 11 of 51 below. A winding path made of DG connects areas of this yard in Woodcote, London, England, created by Joanne Winn Garden Design. Woven rattan lounge chairs add a modern touch to this lush landscape. Continue to 12 of 51 below. A woodland backyard near Chicago designed by Hursthouse Landscape Architects and Contractors features pavers and shredded bark. Care was used to respect the existing trees while also creating additional privacy for the homeowners. Plants include Annabelle hydrangeas, Pachysandra 'Green Carpet' ground cover, and Mission Arborvitae evergreen shrubs. Continue to 13 of 51 below. With the challenge of working around one of the largest oak trees in the appropriately named city of Oakville in Ontario, Canada, Partridge Fine Landscapes added curbed braces and sculpted ends to an organically shaped patio. The flagstone patio was set on a concrete base, with pavers individually cut to accommodate the curves. The pergola is made of Douglas fir. Lime-green hydrangeas soften the landscape. Continue to 14 of 51 below. Love to cook with homegrown ingredients? Take a page from this gardener's book and use your empty backyard to harvest the ultimate vegetable garden. Blake uses his backyard to grow vegetables in raised boxes, including big, beautiful heirloom tomatoes in a variety of colors. You can follow his vegetable-growing adventures on his Instagram account, @backyardgardener84. Continue to 15 of 51 below. A woodland garden in upstate New York created by Earth Mama Landscape Design features a gravel sitting area with stacked-stone retaining wall and flagstone steps leading to the nearby woods. The seamless transition from backyard to forest is appealing for homeowners who enjoy afternoon strolls and outdoor adventures. Continue to 16 of 51 below. Featured on Beautiful Homes of Instagram, Daisy Christof of Long Island, New York, posts lovely images of her home and her model dog, Theo, at @daisyhomedesign. Her she shed has a name—Minnie—and provides a welcome escape for Christof. She loves hydrangeas and has more than 80 shrubs with various species and colors. Looking for a backyard escape of your own? Check out some of our favorite she sheds and he sheds. Continue to 17 of 51 below. A cast-stone path in Northern California created by Michelle Derviss Landscape Design meanders past a colorful mix of succulents, ornamental grasses, and subtropicals like blooming cannas. Continue to 18 of 51 below. Pavers crawl through the tall-growing lawn in this backyard located in London's Lewisham district. Under the direction of Simon Orchard Garden Designs, the urban space includes a separate vertical garden that maximizes space for growing fresh herbs and vegetables. Continue to 19 of 51 below. A beautiful contemporary home in the seaside town of Blairgowrie in Victoria, Melbourne, Australia includes a swimming pool, spa, outdoor kitchen, patio, and softscape (plants) to add some greenery to the yard. The landscape architecture was designed by Acre. Continue to 20 of 51 below. Continue to 21 of 51 below. The yard of a brownstone in Brooklyn's Cobble Hill neighborhood received a makeover from Flo's Gardens that included a flagstone patio, a built-in ipe wood seating and dining area, and shade-tolerant plants. Continue to 22 of 51 below. Bucks County, Pennsylvania landscape architects Dear Garden Associates were tasked with retrofitting existing farm buildings on a property with a new house and lots of land. Slopes that back up to the farmhouse were modified to accommodate terraces, gardens, and paths that link different components of the property. The hardscaping was softened by plants chosen for their flowers and foliage. Among the selections: Purple Smokebush, Mellow Yellow Spiraea, Russian Sage, and Smooth Viburnum. Continue to 23 of 51 below. J. Dabney Peeples Design Assoc. An evergreen plant pallet designed by the Collins Group of South Carolina features autumn fern, Mondo Grass, and Impatiens growing under a canopy of Atlas cedar trees. Those pavers or stones are actually locally sourced recycled granite curbing with mazus ground cover growing between the joints. Continue to 24 of 51 below. A midcentury home and yard located in the Harbor Highlands neighborhood of the Dover Shores area of Newport Beach, California was redesigned by Falling Waters Landscape. The emphasis: simple, clean, updated, and reflecting its midcentury roots. Continue to 25 of 51 below. Wild Paysages of Saint-Ouen, France (home to Paris' flea market) planted a vine for privacy, along with tall bamboo, Japanese privet, and fragrant Burkwood Osmanthus. The children's sandbox was cleverly designed with a tight-fitting cover that stores the sand and toys when not in use and becomes usable deck space. Continue to 26 of 51 below. A dull English garden was transformed into a vibrant yard with circular spaces that lead to a lower-level patio. Created by Green Tree Garden Design, the garden features a cobbled path and interlinking grass circles, with pruned "ball" boxwoods that emphasize the circular theme. Continue to 27 of 51 below. A large Chicago area backyard was redesigned by James Martin and Associates to include a traditional patio with pavers, broad lawn, and stepping stones that lead to an arbor and pergola with another outdoor seating area. Plants include white Viburnum "Snowball". Continue to 28 of 51 below. Karrie lives in Houston, Texas with her husband, Dan, and their four children under the age of 8. She shares images of her beautifully appointed home—mostly decorated in white—along with her big backyard on her popular Instagram account, @ourlittlefoxhouse. Continue to 29 of 51 below. A small yard in London makes the most of its space by using walls to plant vertical gardens. Designed by Living Colour Gardens, the outdoor room features an Ipe-hardwood zigzag bench with illumination underneath for fun outdoor parties at night. The patio is paved with travertine, while raised white-rendered planting beds echo the shape of the bench. Plants include African lilies, Japanese maples, and large Allium bulbs. Continue to 30 of 51 below. A neglected backyard once full of weeds, overgrown shrubs, and trees was transformed by Green Tree Garden Design. Circular stairs link the garden's levels, while brick walls and terraced beds are planted with colorful and evergreen perennials, shrubs, and vines. Continue to 31 of 51 below. Outdoor projects are a passion of North Carolina craftsman company Outdoor Artisan. Their Instagram account, @outdoorartisan, shares images of their projects, including this outdoor living room with a pergola. The cutout on the pergola roof allows taller people to use the stairs without having to duck! Continue to 32 of 51 below. Even inside city limits of Lafayette, Louisiana, the Designs by Robin team maximized yard space by creating a customized pool layout. While small, the pool includes a tanning ledge with partial submersion, a fountain, and decking that separates it from the lawn but allows easy entry and exit for swimmers. Continue to 33 of 51 below. For homeowners who once lived in Lebanon, A. J. Miller Landscape Architecture of Syracuse, New York, opened up the backyard and chose colorful plants with a Mediterranean look. Within a limited amount of outdoor space, the firm designed areas for frequent outdoor entertaining and dining. Continue to 34 of 51 below. Using a color palette based on the tones of a tree in the center of the garden, O Plus L blended the interior with the exterior of this California Modernist home in Pacific Palisades known as the Ravoli Estate. This was achieved by using the same surface and flooring materials inside and out and echoing the home's horizontal lines in the backyard. Continue to 35 of 51 below. The owners of this home in Potrero Hill near San Francisco asked Seed Studio to redesign their backyard so that it could feel intimate for two, yet accommodate large gatherings. Along with an outdoor living room that offers views of nearby Bernal Hill, the space includes a seat-height deck that surrounds a Corten steel wood-burning fire pit. Plants that work with the rocky soil include succulents, bamboo, and even a vegetable garden. Continue to 36 of 51 below. A path that begins in the front yard of this Kansas City, Missouri, home leads to the backyard and deck. The entire property was transformed by landscape designer Aaron Bradley of Aesthetic Outdoor Design. Continue to 37 of 51 below. A stone patio designed by Rolling Landscapes is situated near the house and is self contained, providing its owners an outdoor kitchen, living room, and vine-covered pergola that creates shelter and privacy. Continue to 38 of 51 below. A geometric backyard designed by James Martin and Associates of Vernon Hills, Illinois, features bluestone steps, a retaining wall, and embedded pavers. Continue to 39 of 51 below. A townhouse in Tucson, Arizona, was expertly remodeled by Prideaux Design , and features colors of the surrounding desert and incorporates a spa, outdoor kitchen, seating and dining areas, and a place to lounge. Continue to 40 of 51 below. When the offspring flew the coop, the owners of this home in Menlo Park, California enlisted the expertise of Sycamore Design to create a more adult-oriented backyard. Sycamore designed a backyard with an emphasis on entertaining, dining, and relaxing by the fire pit. No-fuss features include gravel and native plants. Continue to 41 of 51 below. By day, this London backyard redesigned by Echinops Garden Design is a series of modern terraces with ipe hardwood seating and Western red cedar fencing. At night, the garden lights up as each level offers a different vibe and the built-in seating and plants are illuminated in different colors. Continue to 42 of 51 below. Once a boring courtyard, this renovation in Naples, Florida became an outdoor space that reflects the color of flair of its location. Designed by Malibu West Interiors, the patio is surfaced in a non-skid textured porcelain tile. The pool coping was custom-cast in concrete to mimic the shape of the swimming pool. A colorful wall piece was made of teak with pops of glass tile. Continue to 43 of 51 below. By losing the lawn, installing drought-tolerant plants, adding a water feature, and rasing a dining terrace, Genus Loci Ecological Landscapes updated a yard in Toronto, Canada. The dining area wall also provides another layer of privacy. Continue to 44 of 51 below. A backyard designed by Bliss Garden Design of Seattle takes advantage of the frequent rainfall by incorporating plants in various shades of green for a lush, private backyard that offers its owners a true escape. Continue to 45 of 51 below. A home in the Chicago suburbs designed by James Martin and Associates focuses on outdoor entertaining with a swimming pool, patio, view, and several seating areas. Continue to 46 of 51 below. The driveway of a bungalow in Salt Lake City was transformed by landscape designer Richard Laughlin into much-needed backyard space. Laughlin used plants that are native to the region for a colorful front and backyard makeover. Continue to 47 of 51 below. Portland, Oregon-based Paradise Restored gave the owners of this newish tract home a customized backyard that includes an outdoor kitchen, seating areas, spa, a lawn, and a fire pit. Continue to 48 of 51 below. Landscape architect Carol Heffernan of Heffernan Landscape Design bought the property next door and combined both into a home and office space in Chicago. There, clients visit and see for themselves what Heffernan's work looks like, including this patio with an outdoor fireplace. Continue to 49 of 51 below. A synthetic lawn gives the look of a lush English backyard without the maintenance in this design by Tom Howard Garden Design and Landscaping. Square pavers are embedded in the faux lawn near a narrow bed that features Spanish olive trees and lead to a corner built-in seating area. Continue to 50 of 51 below. A petite plot in the northwest London burg of Kentish Town was designed by Fork Garden Design to include a bench with storage made of synthetic decking and a synthetic lawn. Continue to 51 of 51 below. An outdoor dining space designed by Eckersley Garden Architecture of Victoria, Australia, features a vine-covered pergola that provides shade and ambiance.